When choosing a web hosting service, there are numerous considerations that you should take into account. One of those considerations is whether the hosting service provides users with a dedicated IP address. Unlike a shared IP, a dedicated IP gives you greater latitude with your server. A dedicated IP, also known as Internet Protocol, is a unique address that is assigned specifically to your website. With this unique identifier, users can access your website and gain more security. Unfortunately, dedicated IP addresses also tend to be more costly. However, the advantages of a dedicated IP certainly do warrant the cost. The only type of IP address that you can attain through iPage is a shared IP addresses. iPage is a shared hosting company, which means that a shared IP address is more appropriate for the purposes of the service. With the shared IP address, iPage web hosting service users are required to share the servers, bandwidth, and disk space. As a result, when there is a great deal of traffic on the server, users may experience slower websites that are not as effective as they could be. Another issue that arises with shared servers is that they are also known to be less secure than dedicated servers. To mitigate the concern among users, iPage offers SiteLock Security Suite for free. Overall, since iPage does not offer a dedicated IP address, it may be something that you may want to think about if you are considering this web hosting service. 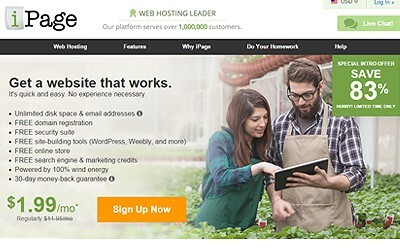 There are many other web hosting services that are fully capable of meeting your needs if iPage cannot do so.